Early in my career, I hesitated to speak up on client calls with senior leaders. I thought my opinions were wrong and needed strong validation from my team in order to share. After sending several messages about it to my manager, she finally told me, “Just speak up and tell them what you think!” That emphatic comment got me thinking, WHY was I behaving that way? Only when I challenged my assumptions and way of thinking was I finally able to change my behavior and speak up in meetings with these leaders, even in the same room. It was a big step in realizing that I needed to break my old mental model. What are the Mental Models and Why Are They Important? Mental models are frameworks consisting of our underlying assumptions from socialization, values, beliefs, education, and experience that helps us organize information. Put simply; our mental models dictate how we understand our world. They’re important because they heavily influence how we intake information, and how we react to it. Individuals, leaders, teams, and organizations need to understand the why behind their thinking and behaviors. Mental models influence not only leadership reasoning and behavior but also organizational outcomes. And often, mental models become barriers to change, rather than enablers. 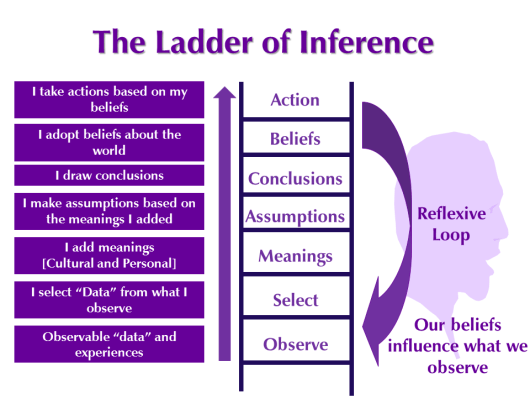 Peter Senge developed the “Ladder of Inference“ (first proposed by Chris Argyris) in the Fifth Discipline Fieldbook to illustrate our critical thinking as individuals. It also works as a reflective loop; our beliefs influence what we observe. Conclusions based on our own beliefs and assumptions are usually “obvious” to us, but we often jump to them by missing steps and objective facts. Most people start at the top of the Ladder, diving right into action. But what if we start at the bottom? We can change where we focus our attention, for example, by observing information and a range of data we relate to without quickly assigning meanings. When adopting meaning, from a cultural or personal standpoint, we tend to tune-in into our own experience and want to hear what others have to say. We may also end up keeping our meanings in our heads or reserving our opinions for ourselves. Breaking mental models is a powerful practice for individuals and leaders alike. But how can we apply this practice to an entire organization? What can we do as Organizations? Unfortunately, many great ideas are never put into practice in organizations, typically because they conflict with our internal understanding of how the world works. But if we keep making the same mistakes over and over again, we are not learning. Two people with different Mental Models can see the same situation and describe it differently. At gothamCulture, our team facilitates various exercises to show participants new ways of thinking, various points of view, and different communication styles. Participants learn to observe their teammates’ communication styles and ways of describing information, adjusting and learning as a team to solve a problem, as well as applying this activity to their work. The biggest challenge with mental models is that we often don’t realize that we act a certain way. Our mental models are so embedded in the organization that we forget (or aren’t given permission) to challenge our thinking. There are other ways to challenge your organization’s mental models, as well. Successful companies often stumble by ignoring trends in the market and/or making the wrong decisions about the future. Once a leading innovator, Kodak missed moving from physical to digital products, and in 2012 filed for bankruptcy. The company overlooked important trends, like cameras merging with phones, and people started to abandon printing pictures to post them on social media instead. Surely there were many reasons why this happened, including the lack of investment in digital innovation and not realizing that online photo sharing is not just a small expansion of business but the new business. Kodak’s mental model didn’t work well in the changing, disruptive technological environment. The great lesson from Kodak is that the well-established view of the company will be forced to change with the new technologies, customers, competitors or an emerging environment. This is one of the reasons why it is so important to promote organizational innovation and not to miss opportunities to pivot when needed. People thrive (as I have seen in bigger organizations) when they learn what people do in other departments, how they work, what do their daily life look like, their pressures, and their world. People often do not understand and thus do not appreciate what others do. They are hungry for more understanding. In my experience, it’s helpful for them to learn more what others do in different departments, not only to appreciate and understand the work of others but also to apply this knowledge to their own thinking and behaviors. Leadership not driving the organization: We look at leaders to set the right example for other employees in the organization. When leaders don’t role model the behaviors they value and would like others to demonstrate, it welcomes all sorts of misaligned behaviors and consequences. Great leaders should align the company’s strategy with its mission and structure. If the strategy is missing or unclear, there is no common direction or criteria for decision-making. Misaligned people practices, including incentives or rewards: If these practices are not aligned to company’s strategy and support the employee lifecycle (hiring, retention, promotion, succession planning) or if rewards don’t support the employees’ goals, it creates unintended consequences. These consequences often manifest as an absence of motivation, low standards and morale, frustration, high turnover, and lower performance. Organizational silos: Working in functional organizational silos over extended periods of time will create tunnel vision, which is often reinforced by individuals trying to protect established mandates and processes. Moreover, this tunnel vision restricts knowledge sharing and learning. Inefficient management processes: There are certain aspects of work that don’t add value to an organization, such as following a strict structure and set of rules, and not operating with a growth mentality. A bureaucratic structure negatively affects organizations, as it stands in the way of the organizations’ adaptability to change and may also limit organizational innovation. Our mental models dictate our thinking, mental images, decisions, and the way we act. But in order to innovate, create, and grow as individuals we need to break the pattern. Breaking old embedded mental models implies changing behaviors, which is never easy and takes time. Step ahead now to challenge your mental model to avoid falling behind your competitors like Kodak, and instead, innovate to stay ahead. Many great ideas never get put into practice because of organizations’ mental models. We often fail to adapt to our rapidly changing environment due to those deeply embedded ways of seeing the world. But, leaders can help advance learning and innovation by promoting teamwork and collaboration, creating a safe environment for people to share, ensuring open dialogue and reflective conversations, being able to discuss their own mental models, and project mental models in the future through strategic planning. Kate Gerasimova, associate at gothamCulture, has over 4 years of consulting experience, helping clients create efficiencies and improve their business performance through strategy and organizational development, change management, and process improvement. She is passionate about aligning organizational culture with business strategy and finding creative solutions to today’s organizational development challenges.